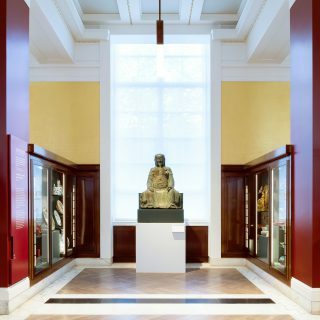 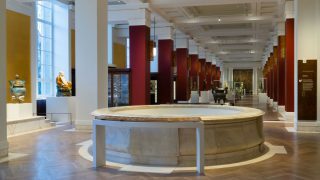 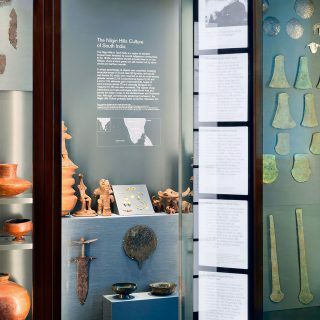 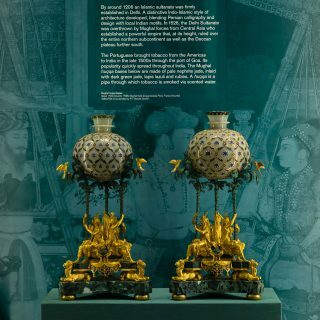 At 115 metres long, the Grade I Listed Sir Joseph Hotung Gallery of China and South Asia is the longest gallery at the British Museum, and has displayed its collection of Chinese and South Asian antiquities for over a century. 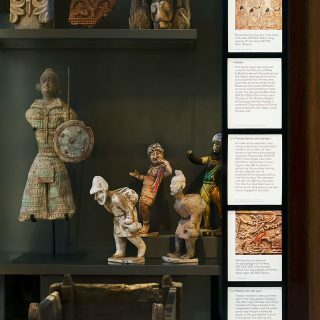 After 25 years of passing visitors and neglect, the gallery contained over 5,000 priceless objects and required both the careful refurbishment of the existing space as well as upgrades to meet the environmental needs of the museum in the 21st century; and a reimagined exhibition space filled with imagery, stories and colour. 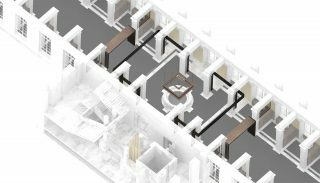 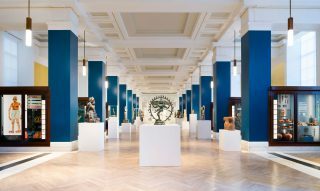 The new design innovatively reframes the old architecture to provide a narrative-led route through the gallery. 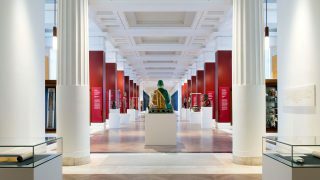 Burgundy painted columns mark the rich history and culture of China, and a bright peacock blue represents the life of South Asia. 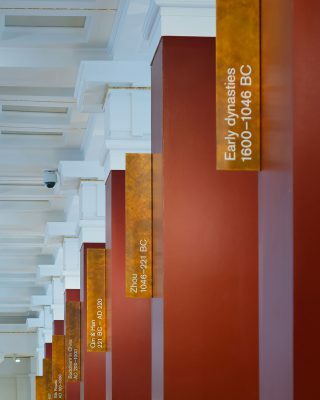 Each of the 32 bays of the gallery is demarcated by a title fin and provides a backdrop for an era, culture or theme. 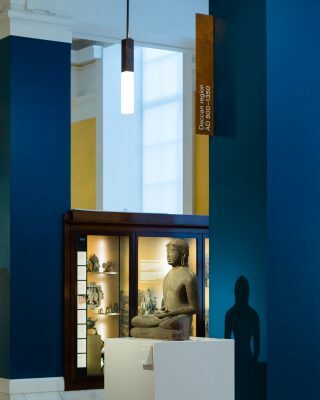 Welcoming the audience into each bay is a new bespoke pendant light fitting in patinated brass and quartzite, emphasizing the repetitive rhythm of the architecture. 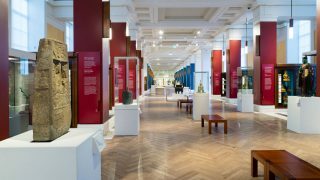 Patinated brass is repetitively used to highlight key interpretational devices: gallery introductions, star objects and AV interactives. 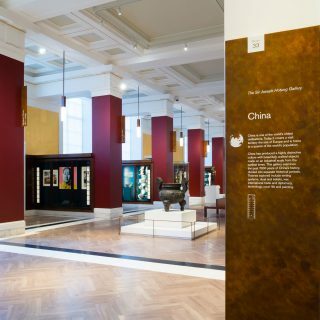 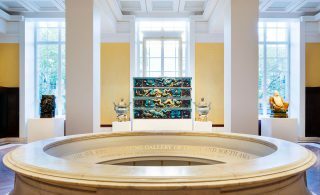 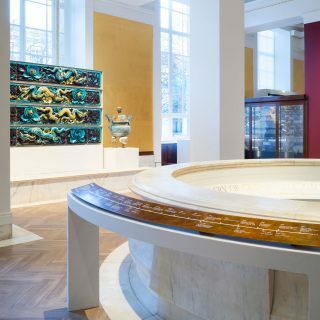 In addition, a new unearthly green patina was developed with a local specialist, to mark the gateway into the refurbished Selwyn and Ellie Allyne Gallery of Jade antiquities, that was also undertaken as part of the project.